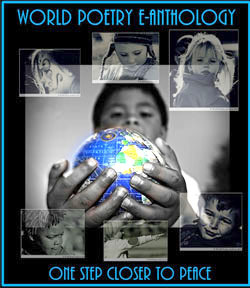 World Poetry Celebrates Oswald Okaitei from Ghana! 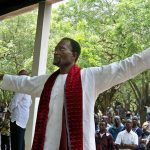 Ariadne’s Notes: Oswald Okaitei, World Poetry Theatre Director and multi-award winner, called in from Accra, Ghana at 1:40 pm PST with interactive song and poetry poems. It was great to hear what he is doing and the possibility that he may visit Canada in August. 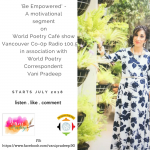 We also want to thank him for his warm words about World Poetry Canada International and how our belief in him has helped. The World Poetry Café had an enchanting show on April 27, 2017, CFRO 100.5 FM with poets from Israel and Ghana phoning in. World Poetry team: Ariadne Sawyer, MA, producer and host, co-host Anita Aguirre Nieveras , Super tech, Victor Schwartzman , special volunteers, Sharon Rowe and Willow, the dog. POET OSWALD IS 5 YEARS. A product of the famous but erstwhile “By The Fireside”, Oswald Okaitei celebrates 5 years of actively pursuing his passion for poetry on May 5, 2017. 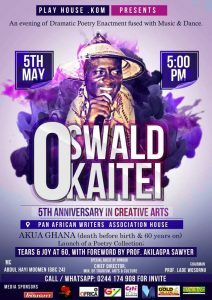 That makes up for a lot of fives in his life and on that day, his birthday, he again takes to the stage at the Pan African Writers Association (PAWA) House in Accra to celebrate his fifth year in the Creative Arts. Whoever actually achieves anything at the age of five? That, of course, isn’t the kind of age at which people hit the world stage with anything in particular. But that is where the bus stops with the 5 international award-winning poet and playwright, Oswald Okaitei. Five years into his career as a poet, Spoken word artiste & Creative Artpreneur, Oswald has done and seen things in the industry that can only be tagged as instrumental. His has been a story of motivation fueled from having stepped out of the university, hopeful, like most of his kind, of securing a good government job only to be so disappointed when he found out that there was a ban on government employments. Itching to remain active even without someone having to pay him to execute a job, he fell on the one thing that not even money can buy—his gift. And his gift was in the ability to beautifully string words together into thought-provoking poetry and music. Today, Oswald has broken frontiers as one of the youngest and fast-rising poets who have performed on big stages with the best of the best in the industry—the likes of Muta Baruka, Pro. Atukwei Okai, Rocky Dawni, Prof. Kofi Anyidoho among others. 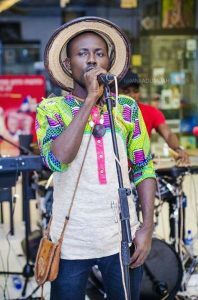 His ability to blend rich Ghanaian folk music with his equally enchanting poetic lines is what has earned him many accolades and the opportunity to be featured on a lot of National & International platforms. That said, he has also authored five (5) poetry collections—A WREATH TO AWOONOR, THE SAILOR’S SAIL IS OVER (For Komla Dumor), SONGS OF CONDOLENCE TO TACLOBAN, A BRIGHT LIGHT SLEEPS (For Maya Angelou) & MANDELA: THE SOUL OF HIS EARTH—and has been featured in several international anthologies (World Poetry Peace Anthology, Muse For Peace et al). Oswald has written quite a number of stage plays, notable are “IN THE BAG OF A WOMAN”, “IN MAN’S LIBIDO”, “BEAUTYFUL NONSENSE”, “WHO STOLE THE CASKET?” among others. Oswald Okaitei is currently a World Poetry Director from Ghana, has five international awards to his credit—World Poetry Empowered Poet 2013, Pentasi B. Inspirational Poet, World Poetry Theatre Ambassador award, Global Baobab Award and recently, The Spoken word Artiste of the Year 2016. The night of 5 May, will be one of dramatic poetry enactment, fused with rich music and dance, titled, Akua Ghana (Death before birth and 60 years on), in commemoration of Ghana’s 60th Anniversary. The night will also see the launch of yet another book from the poet and author titled TEARS AND joy AT 60, with a foreword by the celebrated academician, former Vice Chancellor of the University of Ghana & former President of Ghana Academy of Arts & Science; Prof Akilagpa Sawyerr. Entrance is free. One must only call or whatsapp +233 571 174 908 or +233 244 174 908 for invite. The Special Guest of Honour is Nana Bright Oduro-Kwarteng (Chief Director, Ministry of Tourism, Arts & Culture). 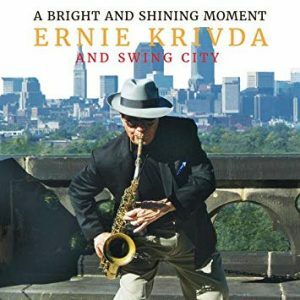 This entry was posted in Ariadne's Notes, E-Poets, Featured Poets, General and tagged Anita Aguirre Nieveras, Author Sharon Rowe, International Peace Award Ariadne Sawyer, Oswald George Okaitei, Pan African Writers Association, Victor Schwartzman, Willow the dog, World poetry on May 1, 2017 by Ariadne.